Multiple sclerosis (MS) is an unpredictable disease of the central nervous system that can range from relatively benign to somewhat disabling to devastating, as communication between the brain and other parts of the body is disrupted. With approximately 10,000 new cases diagnosed each year in the United States, multiple sclerosis is the most common neurological disorder that strikes young adults. 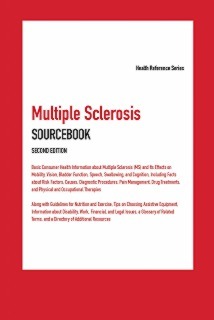 Multiple Sclerosis Sourcebook, Second Edition provides information about risk factors, causes, and types of multiple sclerosis and its effects on mobility, vision, bladder function, speech, swallowing, and cognition. Treatments and rehabilitation therapies are described, guidelines for nutrition and exercise are discussed, and tips on choosing assistive equipment are provided. Information about issues related to disability resources, workplace concerns, and financial planning is also included, along with a glossary and directory of resources. Part I: Multiple Sclerosis: Causes, Risk Factors, and Disease Course presents information about autoimmune disease and the cellular, genetic, and nerve processes involved with MS. It includes facts about how toxic agents, nutrition, or infection may trigger MS and describes other demyelinating disorders and diseases that mimic MS.
Part II: Symptoms of Multiple Sclerosis describes the types of physical concerns that develop in people with MS, including movement problems, tremors, pain, fatigue, speech, swallowing, and vision problems. It deals with the complications that impact breathing, bladder control, cognition, and mental health. A separate chapter addresses pregnancy-related concerns for women with MS.
Part III: Diagnostic Tests, Treatments, and Therapies for Multiple Sclerosis describes various ways MS is diagnosed, managed, and monitored, including benign treatment, drug treatments, pain management, and management of involuntary movement and tremor. Physical, occupational, and counseling therapies are explained, and information is presented about complementary and alternative medical treatments, music therapy, and cooling therapy. Part IV: Living with Multiple Sclerosis offers guidelines for discussing with family, friends, and employers. It includes information about nutrition and exercise and offers techniques for managing fatigue and stress. Individual chapters provide tips for developing a support group, describe home accessibility guidelines, and discuss equipment that promotes self-care, mobility, and independence. Part V: Multiple Sclerosis and Work, Financial, and Legal Issues describes how individuals with MS can navigate workplace challenges and prepare for the future. Financial planning needs, disability benefits, home care, assisted living, and skilled nursing health care options are described and written advance directives are explained. Part VI: Additional Help and Information includes a glossary of related terms and a directory of resources.